Our midwifery services include comprehensive prenatal care, care during labour, assistance with the birth of the baby, immediate post birth care, and home post natal care of mother and baby, including breastfeeding and adjustment to parenting. We recommend contacting midwives for care as early as possible in your pregnancy as demand for care is often more than what we can accomodate. Also, the nature of midwifery care limits the number of women we can provide care to. Ideally, your first visit should be prior to twelve weeks of pregnancy. Occasionally women may begin care later if space becomes available. We are available 24 hours a day, seven days a week by pager. Our clients know they can contact us anytime for questions or concerns that cannot wait until their next clinic visit. The initial visit gives you and your midwife a chance to get to know each other, and will take approximately 1 hour. This visit includes a complete health history and physical assessment including pap test, if appropriate, and breast exam. Your midwife will give you the requsitions to have appropriate bloodwork and ultrasounds done, and there will also be time for nutrition/lifestyle counselling, as well as time for your midwife to address any questions or concerns that you may have. Recommendations for prenatal classes are also provided at this visit. Subsequent visits (every 4 weeks to 30 weeks, every 2 weeks to 36 weeks and weekly until baby’s birth) will be approximately 30 minutes. The health of you and your baby will be carefully assessed. Women weigh themselves and then time is spent discussing the progress of their pregnancy, measuring blood pressure, baby’s growth, heartbeat and movement, and discussing lab results. We know it is important that you and your family have time to discuss issues important to you such as planning for labour and birth, emotional issues, and relationship/sibling/parenting concerns, time is made for this during routine prenatal visits as this is a priority in your care. Laboratory tests and diagnostic tests, such as ultrasounds, or referrals to other health care providers are discussed and booked as necessary. A home visit is scheduled at 36 weeks of pregnancy for women planning a birth at home. An hour is scheduled in our clinic for those planning birth centre or hospital births. This time is set aside to discuss plans for labour and birth. A list of things to have ready for your birth will be given to you, as well, a “birth supplies bag” is available for purchase at our clinic. Assuming that pregnancy and labour is progressing normally, it is a woman's choice where she would like to give birth. It is well researched in Canada, for healthy low risk women cared for by Registered Midwives, that birth at home or in a birth center is equally safe for mother and baby as birth in a hospital setting. Home births, however, have statistically the lowest rates of intervention. Water birth is an option, usually at home or in the birth centre. Many of the women in our care choose water birth for relaxation and analgesia. Hospitals in Europe, particularly the UK offer water birth, and there is limited availability in Calgary hospitals. We have hospital admitting privileges at all hospitals in Calgary, however the majority of our hospital births occur at Foothills Medical Centre and Rockyview General Hospital because of our geographic proximity. Care in hospital is provided by us as your admitting midwives, and generally no hospital staff are involved in your birth unless we specifically ask for assistance. Approximately 85-90% of women wishing to birth at home or birth centre will, in our care, be successful in doing so. Immediately following birth, we are able to assess the health of mother and baby, assist with breastfeeding, and of course celebrate with you and your family! If you give birth in either hospital or birth centre, you will generally be discharged to home within 3 hours after the birth. We do home visits several times over the first week to assess mother and baby, ensure breastfeeding is going well, and to answer any questions and address any concerns about newborn care and self care. These home visits are often seen by parents as the most valuable part of their care! We are, of course, available 24/7 by pager for questions and concerns. Mother and baby are seen in our clinic at two weeks post birth, for a complete check up to assess the health of both mother and baby, baby weight, breastfeeding, and emotional adjustment. At six weeks, we conclude care with an hour long visit which includes a well woman and baby check up. A referral letter is provided for the ongoing health care provider, usually a family physician. Although our care is complete after the six week visit, we always enjoy keeping up with families that we have cared for and enjoy updates and visits. Our practice is based on the midwifery model of care which is woman centered, and recognizes pregnancy, birth and breastfeeding as inherently healthy processes. It is based on the understanding that these are profound experiences which carry significant meaning for a woman, her family and her community. It is traditionally wholistic and grounded in the principles of health and well-being. Midwife means “with woman”. We believe that each woman and each birth is unique, and as such must be respected and supported. Birth is something that women do, not something that happens to them. The emotional needs of a woman have a very real impact on the well-being of her baby. Prenatal visits within the midwifery model tend to be longer, allowing for more time to address questions and concerns. The midwifery model of care recognizes the importance of nutrition as a way to prevent the most common complications of pregnancy. It emphasizes the importance of companionship and encouragement during labour as a way to minimize technological interventions in the birth process. It does not impose arbitrary time limits on natural processes. Within the midwifery model, medical intervention is not viewed as appropriate unless it is truly necessary. It also recognizes that in some cases medical intervention may sometimes be necessary and it will be applied appropriately in those cases. "How can we thank you enough? You made our experience of bringing Terrence into the world so positive and fulfilling. We will remember his birth at home as one of the best days of our lives. And never for a moment, did we feel scared or panicked when you were with us. What you do is invaluable. Thank you." "Words can’t really say thank you enough for the incredible experience we’ve had with you…you offer such a calm, reassuring presence that makes even a new mom feel confident! From our prenatal care to post partum support, we always felt this labour and birth experience was treated as a natural process –so thank you for that as well. We feel very grateful to have had the birth experience we did for our first time. All the moms, dads and babies who have been supported by you are truly blessed." "Thank goodness for women like you who help women like me to have the births we want. You’ll never know how much you mean to us." "To our amazing midwives, we couldn’t have done it without you!! Thank you so much for your wonderful support, care and love. Your presence and help made the births of Hannah and Samuel peaceful and joyous, you are amazing midwives, so kind and giving. Thank you dearly." "Brendon, myself and our families thank you for all the love, support, patience, and guidance that you gave to us during our pregnancy and birth. Benjamin’s birth was the most special day of our lives and we wouldn’t have wanted that day to go any differently. We will be forever grateful to you for being such an important part of the delivery of our first born." There is a large body of evidence that supports midwifery care as a safe choice for low-risk healthy women. In fact, researchers found that women and babies did better on average in countries where midwifery was the normal care. 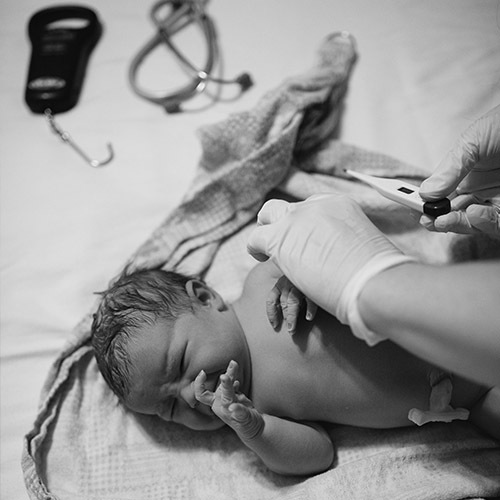 FACT: Midwifery clients experienced lower rates of forceps, vacuum extractions, cesarean sections, episiotomies, infections and babies born requiring resuscitation, in studies where midwifery was compared to physician led care. Yes, midwives have been regulated in the province of Alberta since 1998, and are currently regulated through the College of Midwives of Alberta. The title "Midwife" is a protected title in Alberta and its use by anyone other than a Regsitered Midwife is illegal. Currently there are approximately 80 Registered Midwives in the province. For a complete listing see the College of Midwives of Alberta website. Do I have to pay for midwifery care? No. As of April 1, 2009 midwifery care in Alberta is fully funded by Alberta Health Services. All midwifery clients must have a valid Alberta Health Care number to be eligible for midwifery care. If I have a Midwife, do I need a Doctor as well? No. Midwives are experts in healthy pregnancy, normal births, and well babies. Midwives will consult with Family Physicians, Obstetricians, Pediatricians, or other specialists should the need arise. About six weeks postpartum, your care will be transferred back to your Family Physician who will resume responsibility for the health of you and your new baby. Midwives consult with Obstetricicans if a situation arises during pregnancy that falls outside of the Midwife's scope of practice. Midwives have clear indications for consultation and/or transfer of care as set out by the College of Midwives of Alberta. Cochrane Community Midwives maintains very good working relationships with the Obstetricians in the city of Calgary. What experience and training do Midwives have? All Registered Midwives in Alberta have earned the equivalent of a Bachelor degree in Midwifery. They have demonstrated a high level of competency as required by the College of Midwives of Alberta through rigorous clinical, oral, and written examinations. Registered Midwives are also required to maintain their skills through yearly re-certifications. Can I have a midwife if I plan to give birth in a hospital? Yes. Midwives support a woman's right to choose place of birth and offer women the choice of home, birth centre, or hospital birth. 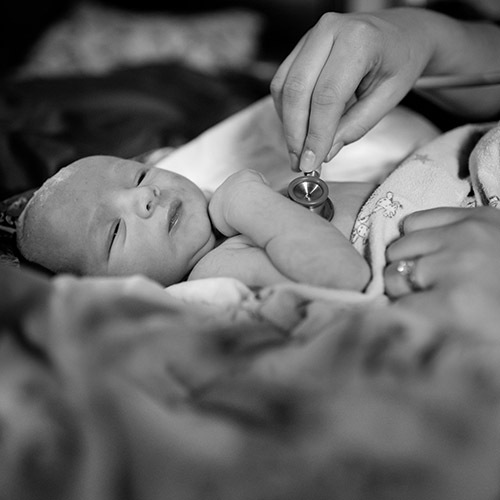 All Registered Midwives maintain hospital privileges so they can provide comprehensive care in all settings. Midwives can order all lab, ultrasound, and diagnostic testing as well as prescription medications that are relevant to pregnancy and postpartum. Does having a midwife mean I can't have an epidural? Midwives have a low intervention style of care. This is based on our belief, supported by research, that the physiological process of birth works best without interference. For example, midwives use natural alternatives such as water, position changes and continuous labour support to help cope with pain in labour as opposed to the routine use of drugs and birth technology. Although sometimes necessary, epidurals, drugs, and other medical technology are regarded by midwives as tools rather than routine interventions. Usually visits begin when pregnancy is confirmed and end when the baby is six weeks of age. Visits every four to five weeks for the first and second trimester are typical. By 30 weeks gestation we begin visiting with our clients every two to three weeks and weekly after 36 weeks until the birth. Visits are usually 20 to 60 minutes long, allowing the midwives to assess your physical health, allow time for informed decision making, and to determine how well you are doing emotionally and psychologically. Between visits there is a midwife on call 24 hours a day that you may telephone with concerns. In the postpartum period, 2-3 visits are conducted in your home for the first week following the birth. Subsequent visits take place at our clinic until care is transferred back to your family physician, around six weeks after your baby arrives. Doulas do not provide medical care, and do not deliver babies. Midwives are trained to provide all necessary medical care and ensure the health and well being of you and your baby. Doulas work as a part of the team, with a midwife, doctor and nurse. Doulas provide continuous emotional and physical support to the labouring woman and her partner, and are a positive addition to the birth team for those couples who desire extra support. For more information about doulas, contact the Calgary Doula Association. If you are interested in the services offered by Cochrane Community Midwives (new or repeat clients), please click here to fill out our client intake form. You will be contacted shortly to welcome you to our care (subject to availability) or placed on a waiting list. We accept cash, cheque, visa or mastercard at the clinic. No debit, thank you.